Welcome to a new approach towards teaching and learning math with technology. I could call this approach lessons or activities but I prefer to call them adventures because I hope that each adventure will bring a new perspective on learning math with technology. This idea has been on my back burner for a long time and it’s finally ready to go. Keep in mind that this is also a learning experience for me so I also call it a work in progress. So let’s begin with the road sign adventure. Back in 1992, the Wall Street Journal in an article entitled Reinventing Math (Active learning promises radical changes, as teachers say the rote appproach doesn’t add up) posed this problem: There are 26 sheep and 10 goats on a ship. How old is the captain? When researchers asked 41 second-graders on a math test […], about 90% of the children gave the same answer: 36. This is a surprising answer. According to David Pleaser’s A Student’s Guide to Problem Solving the children should have subtracted 10 from 36 to get the answer. (See Pleacher’s Post.) This, of course, is meant to tickle one’s funny bone, but the reality of it all may be quite surprising. 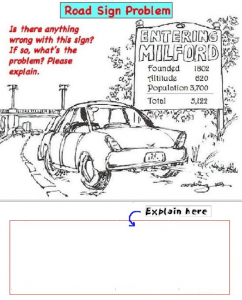 Try the Road Sign problem in your class. It doesn’t matter what the grade level, it never seems to fail.